arrow_forward How to analyze the statistics of multiple campaigns? arrow_forward How to retrieve the statistics of my campaign with the Mailify Sunrise API? How to analyze the statistics of multiple campaigns? The global view provides you with statistical data for a selection of campaigns. The selected campaigns are marked with checked boxes in the left pane, next to the pictogram symbolizing a campaign. You can only view statistics for multiple email campaigns, or multiple SMS campaigns, or multiple automatic campaigns. But you can not combine statistics from different types of campaigns. Indeed, the performance indicators of an SMS campaign are totally different from those of an email campaign. Mailify Sunrise can not accumulate the statistics of several campaigns of different types. The mandatory and discriminating criterion of your selection is the type of campaign. Once you have selected this one, you can further refine your selection by sending date, tags or campaign name. You can also choose to exclude campaigns from your selection if you wish. The first parameter to consider is the type of campaigns whose statistics you want to analyze. As mentioned before, you have the choice between Email, SMS or automatic campaigns. This is a ""radio button"" selector: this means that you can only choose one of these three options, and that you must choose one of the three. By default, the "email" option is selected, and you can see that the current campaign selection is only for your latest email campaigns. Switch from one campaign type to another to view your SMS and automatic campaigns. You can refine your selection by choosing your campaigns by sending dates. For this, a date picker, in the upper left of your screen, allows you to choose the sending period of your choice. A number of predefined choices are available. 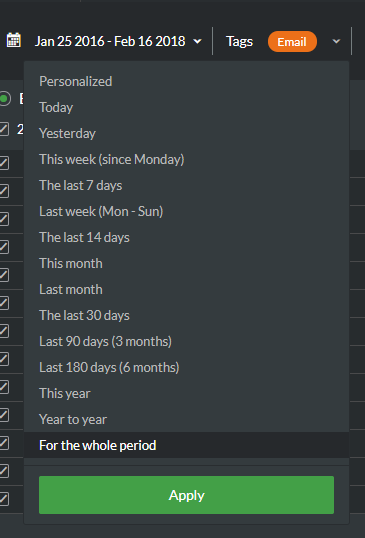 You can also choose a custom period and set the start date yourself. The "For entire period" option allows you to select all your campaigns from the first shipment to the last one. 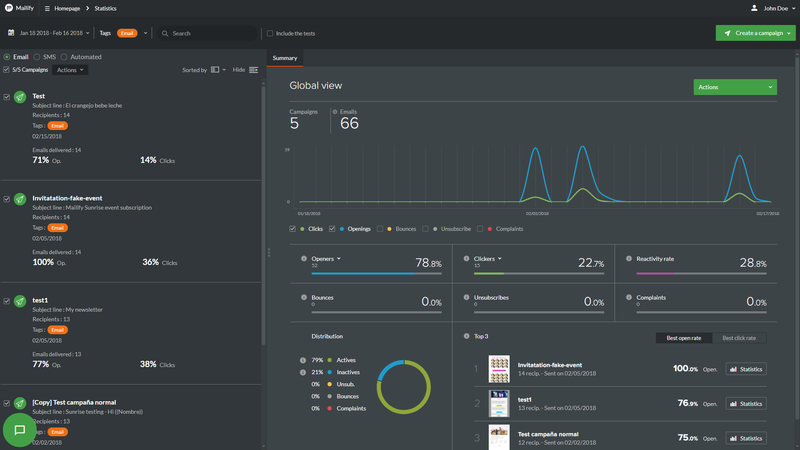 By default Mailify Sunrise displays your last campaigns sent over the last 30 days. At the top of the left pane, you can see that a flyer menu groups your campaigns by month of sending, to facilitate your search. To unfold or collapse a menu, simply click on it. The checkboxes are used to select or deselect a campaign or group of campaigns. You can refine your stats by adding/removing campaigns from your selection. You can select your campaigns based on the tags associated with them. For example, if you have created a "Product A" tag (if you have run multiple campaigns for this product), or a "Customer A" tag (in case you are an agency and you are running campaigns for multiple customers ), you can select all campaigns for this product or this customer using the tags you have previously assigned to your campaigns. 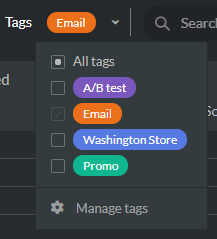 For the record, you can create your own tags and assign as many as you want to your campaigns. To learn more about the tags, click here. You can search for a campaign by name, and add it to your current campaign selection. To do this, simply type the name of your campaign in the field next to the magnifying glass pictogram in the upper left corner of your screen and select the campaign displayed in the search results. On the statistics screen, to the left of each campaign title, a box (checked by default) allows you to exclude or include a campaign to your current selection. When the box is checked, the campaign is included in your selection. When the box is unchecked, the campaign is excluded from your selection. When you uncheck the box associated with a campaign, its statistics will no longer be taken into account in the "global" statistical reporting. This does not mean that you lose the campaign statistics permanently, or you will not be able to reintegrate this campaign into your overall statistical analysis a posteriori. How to analyze the statistics of multiple campaigns? How to retrieve the statistics of my campaign with the Mailify Sunrise API?